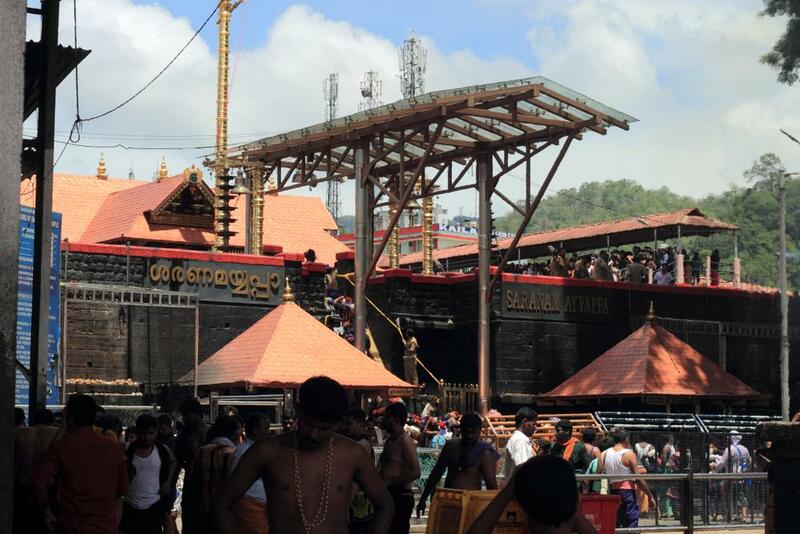 As the Lord Ayyappa temple is all set to open Monday evening for a monthly puja, a thick security cover is in place in and around Sabarimala, which had witnessed protests last month after the Supreme Court permitted women of menstrual age group to offer prayers at the shrine. Devotees, who arrived at Erumeli since Sunday evening, protested this morning against being allowed to leave for Pamba and Sannidhanam. They blocked traffic chanting 'Ayyappa Sarnam'. "We have been waiting since last evening. We were told that we would be allowed to leave at 6 am. Now, they are telling us that KSRTC buses will be allowed to leave only by 12 pm. We have come to offer prayers to Lord Ayyappa. Please allow us to go," an angry devotee said. If private vehicles are not being allowed, they should be taken in the Kerala State Road Transport Corporation (KSRTC) buses to Pamba, the devotee said. Media personnel have also not been allowed to leave Nilackal for Pamba and 'Sannidhanam' (temple complex) from the base camp here till 9 am this morning. Director General of Police (DGP) Loknath Behara has said no restriction of any sort has been imposed on media persons. "To ensure necessary protection to the media, we are not allowing them now. As soon as security arrangements are complete, media will be allowed in Sabarimala and nearby places," he said. At least 15 women police personnel, who are over 50 years of age, have been deployed at 'Sannidhanam' (temple complex). Prohibitory orders under Section 144 of the CrPc, banning assembly of four or more people, is in force at Pamba, Nilackal, Elavungal, and Sannidhanam for 72 hours from midnight Saturday. Around 2,300 personnel, including a 20-member commando team and 100 women, have been deployed to ensure smooth 'darshan' and security of devotees. Pathnamthitta Superintendent of Police T Narayanan told PTI that all arrangements have been made for devotees to have smooth 'darshan'. This is the second time the hill temple would open for 'darshan' after the Supreme Court allowed entry of women of all age groups into it. The shrine would open at 5 pm this evening for the "Sree Chitira Atta Thirunal" special puja slated for Tuesday, marking the birthday of last king of Travancore Chithira Thirunal Balarama Varma, and close at 10 pm on that day. Tantri Kandararu Rajeevaru and chief priest Unnikrishnan Namboodiri would jointly open the temple doors and light the lamp at the 'Sreekovil' (sanctum sanctorum). Devaswom minister Kadakampally Surendran said the state government would ensure complete protection to believers. So far, no women in the 'barred' age group had approached police for protection to offer prayers at the hill shrine, he said. The Pandalam royal family, closely associated with the Ayyappa shrine, said it was "pained" at the heavy security in and around Sabarimala. Protesting the apex court verdict, a 'prayer yagna' will be held in Pathnamthitta, the family said. So far, 3,731 people have been arrested and 545 cases registered in connection with the last month's violence. The Bharatiya Janata Party (BJP) and various Hindu outfits are on a warpath against the Left-front government over its decision not to seek a review of the top court verdict.